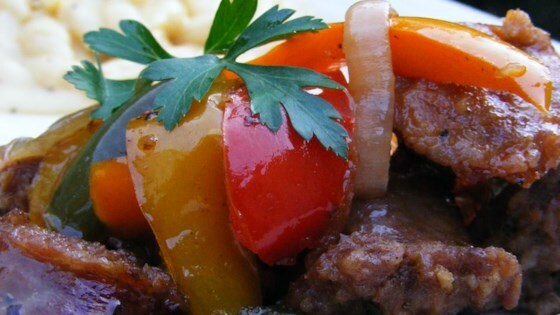 "My family has been using this very simple and delicious recipe for sausage, peppers, and onions for years and years now. For an extra kick, try using half sweet sausage and half hot sausage!" Place the sausage in a large skillet over medium heat, and brown on all sides. Remove from skillet, and slice. Melt butter in the skillet. Stir in the yellow onion, red onion, and garlic, and cook 2 to 3 minutes. Mix in red bell pepper and green bell pepper. Season with basil, and oregano. Stir in white wine. Continue to cook and stir until peppers and onions are tender. Return sausage slices to skillet with the vegetables. Reduce heat to low, cover, and simmer 15 minutes, or until sausage is heated through. Add a little more white wine while simmering if needed. Fabulous! I use beer instead of wine, olive oil instead of butter, and a yellow pepper instead of green. I serve this in rolls and it's a family favorite.